My wife and I just got back from three fun-filled weeks in not-so sunny Florida. Although we had more rain than was usual for the time of year (Dec. 23-Jan.12) we still managed to travel around the State and, of course, visit Walt Disney World! Now, as you look at our Disney loot above, you’ll notice that not all of it came from the Mouse’s house. So in this post I’d like to share with you where we got our loot, and give some recommendations as to where you can find some great deals on Disney items outside of the Parks and Resorts. This was regularly priced at $24.95 US but we got it on sale for just $9.99 US. 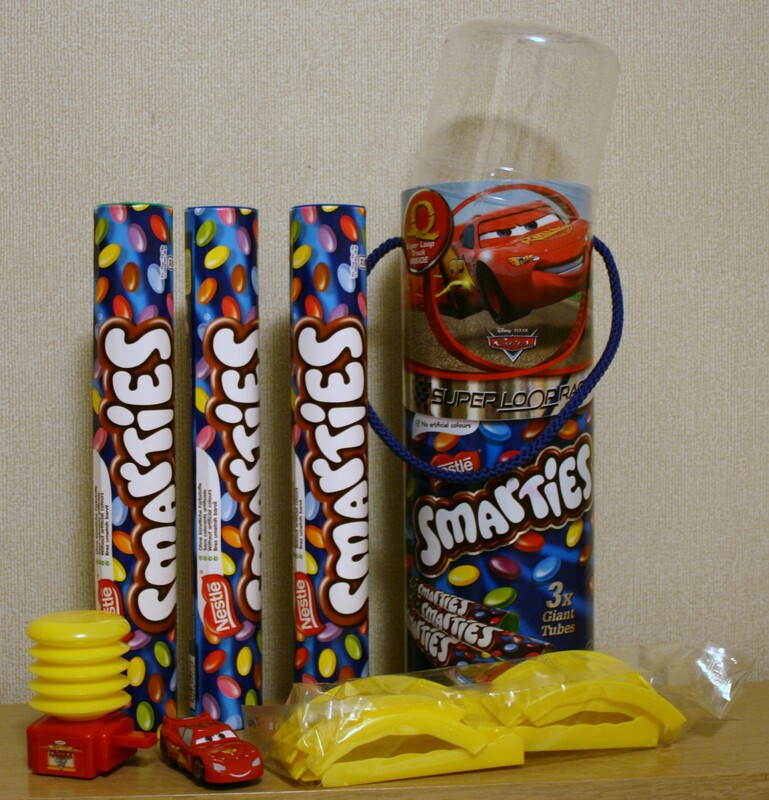 Just the Smarties alone were worth that! But we also got a neat carrying case, and a toy racing track complete with Lightning McQueen himself. Not a bad find, and it became the first piece of loot on our trip. 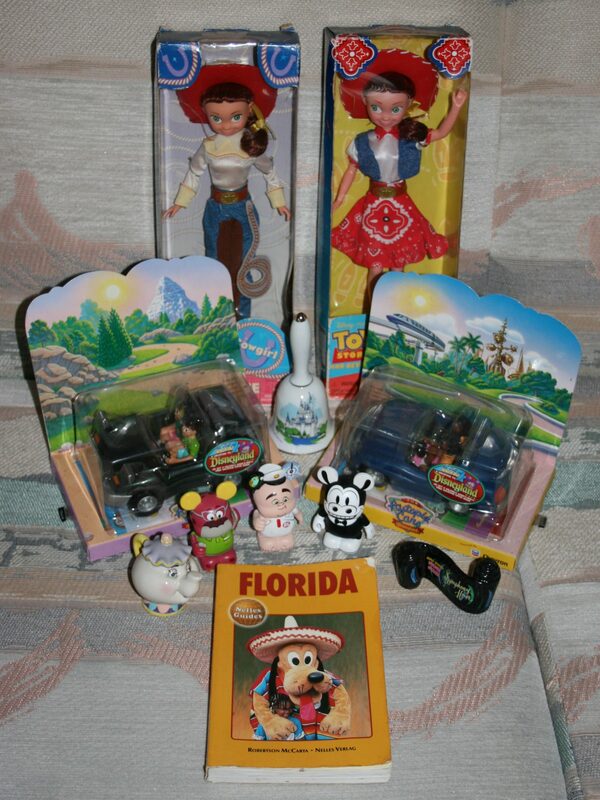 We picked up the Jesse dolls for just $20.00 US for the pair and the Chevron Autopia cars for just $15.00 US for the pair. The three Vinylmations we got for $10.00 US for all three. Now this is a good tip: We were able to trade one of them for a better character at WDW when we went later on. The purple guy on the right (from Monsters U) is my WDW trade. So in effect, we only paid $3.33 US each for Vinylmations that usually cost over $12.00 US. 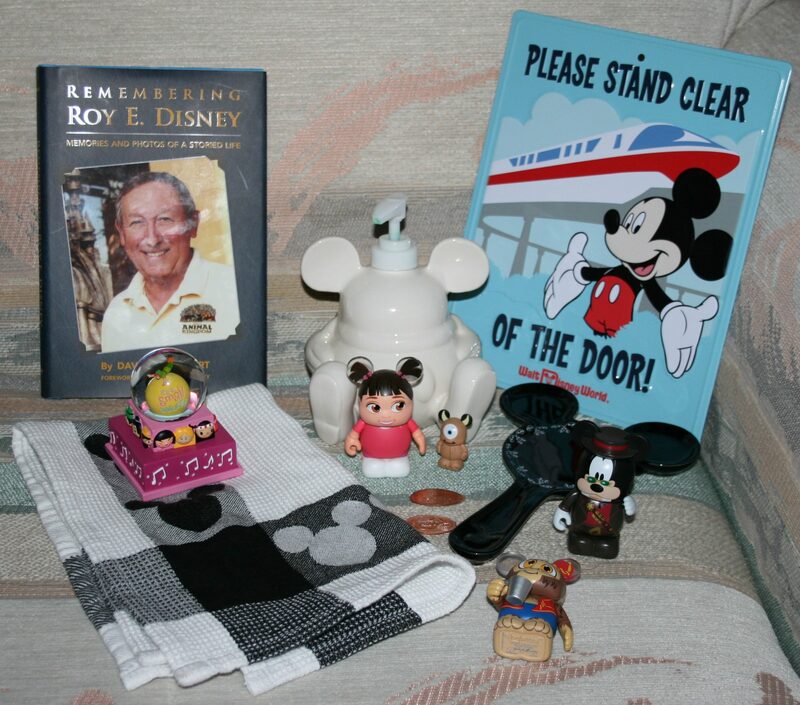 The rest of the items in this picture are simply things you can’t buy at WDW anymore, so they are great finds, and a great reason to check out even the smallest of second-hand shops while on vacation! Michael Eisner, the former CEO of the Walt Disney Company, started the ball rolling on this beautiful old-style community. If you haven’t gone, you should! It’s only about 15 minutes from Downtown Disney and well worth the drive. There are nice shops and Disney-like settings to enjoy. 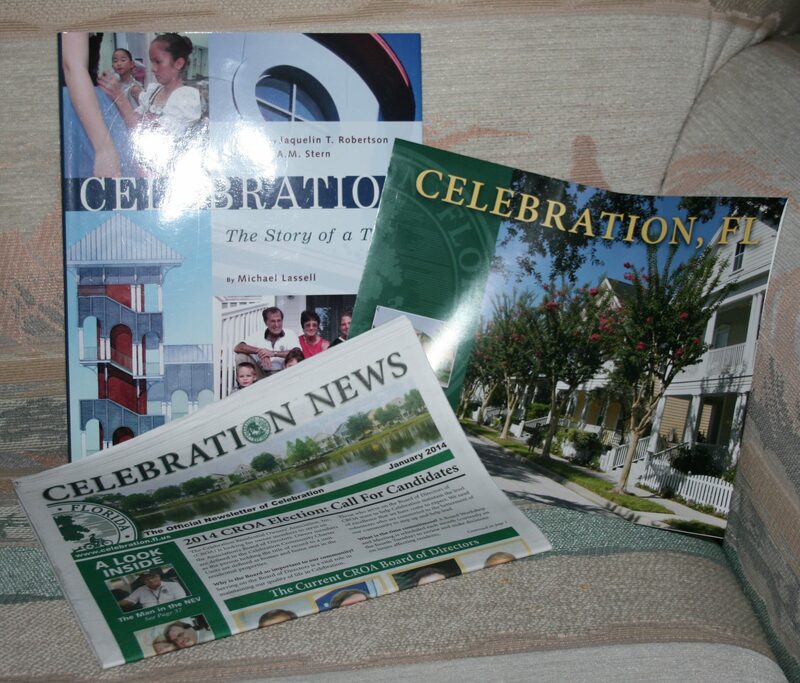 We picked up the local newspaper (free) and a glossy map of the town (also free) but had to pay $40.00 US for the hardcover book about the history of this town that is not really a town. Read the book, you’ll understand! Loot like this can only be found in Celebration, and will help to complete your Disney obsession! 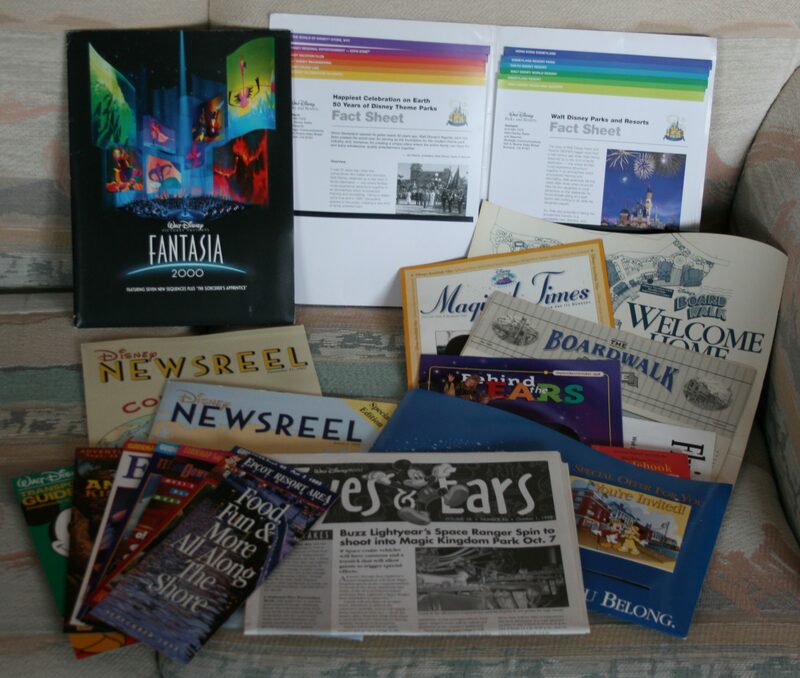 These are vintage publications from the Disney Vacation Club, Cast Member exclusives, theme park maps from 1998, a press kit, and a really cool package giving all of the stats on the Disney Company as of the 50th Celebration in 2006. We picked up all you see above for just a little over $20.00 US. And again, you can’t get this stuff at WDW, so if you want a few unique items for your loot bag, be sure to visit TPC, or similar places! As you can see, we didn’t buy much directly from the Mouse. He doesn’t dicker on price! But there were a few items we just had to have. We brought two Vinylmations from home to trade, and you can see the two final figures we ended up with on the right of the picture (subnote: most of the trading places had truly awful characters to trade, and it took over a dozen tries over 4 days to get just these two acceptable trades. Be prepared!). We bought the Boo Vinylmation for full price in a blind box and were thrilled when we got her as she was the only one we wanted out of that series! The kitchen stuff was bought with a gift card we got given to us for our wedding anniversary (24 years on Jan. 13th!) 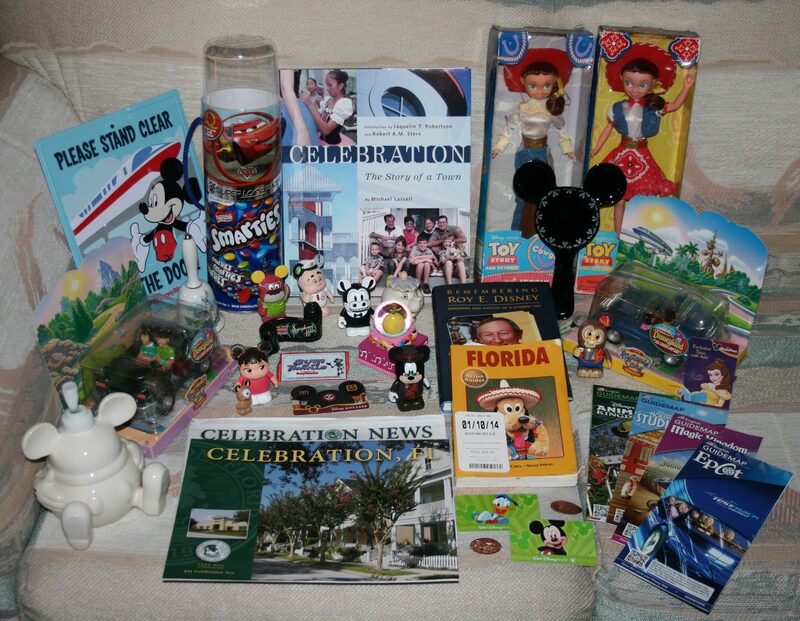 The rest are just a few small items that came into our loot collection near the end of our trip when we were… running out of money! So if you can manage it, be sure to spend some time looking around the shops and second-hand stores of Florida before you spend all of your loot money at the Mouse’s house! Deep discounts can be found at Disney Outlet stores which usually carry much of the same stuff you’re planning to buy on-site anyway. I hope you enjoyed sharing in my loot! Do you take loot pictures too?